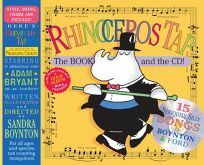 Author-illustrator-composer Sandra Boynton bops into summer by putting a fresh coat of paint-literally-on her 1999 book-and-cassette package Rhinoceros Tap, a collaboration with Mike Ford and Adam Bryant. A redesigned edition of the book packaged with a remastered CD is now available. The new look/format-new cover colors and design; more elongated, rectangular trim-size for the book; CD replacing the cassette-makes it a perfect companion to Boynton and Ford's Philadelphia Chickens. Additionally, CD-only versions of both titles are available from Rounder Kids. .